The following instructions are intended for users who are using the Colossus Piano App for the first time. 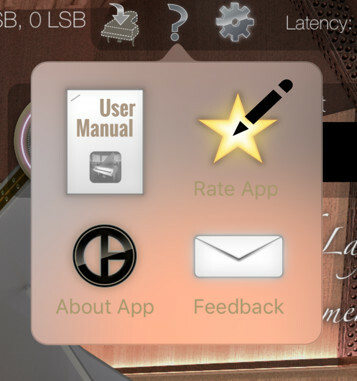 It provides an introduction how to use the App and an overview of the most important features. After you purchased and downloaded Colossus Piano from the App Store, you can launch the App by tapping on the Colossus Piano icon on your iOS desktop. If you want to control the Colossus Piano App with an external MIDI keyboard, then please first connect the external MIDI keyboard to your iPad / iPhone / iPod before starting the Colossus Piano App. When you launch the Colossus app for the first time, you will notice that all piano models and their option controls are displayed semi-translucent and you hear no sound yet when triggering notes. That's because you first need to download a piano model. 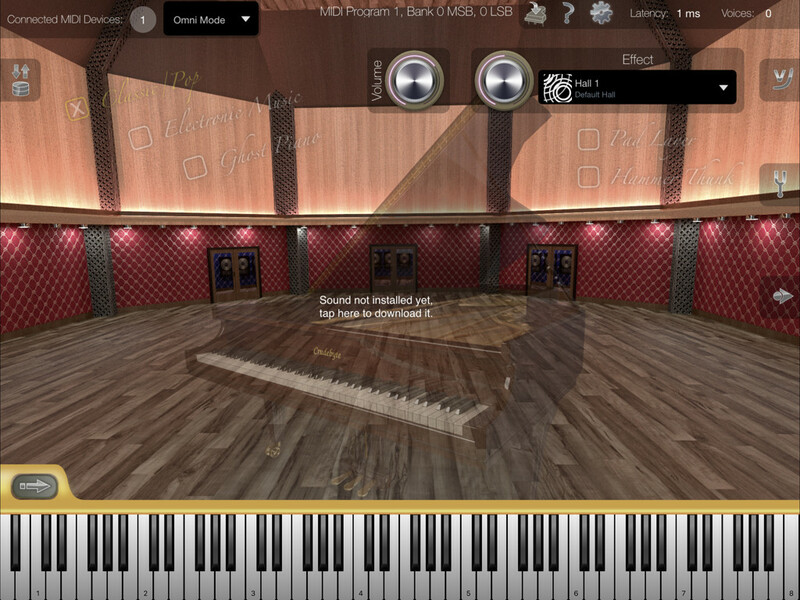 So open the piano models screen by tapping on the small piano icon on the very top of the screen to see an overview of all available piano models of the Colossus app, like shown below. 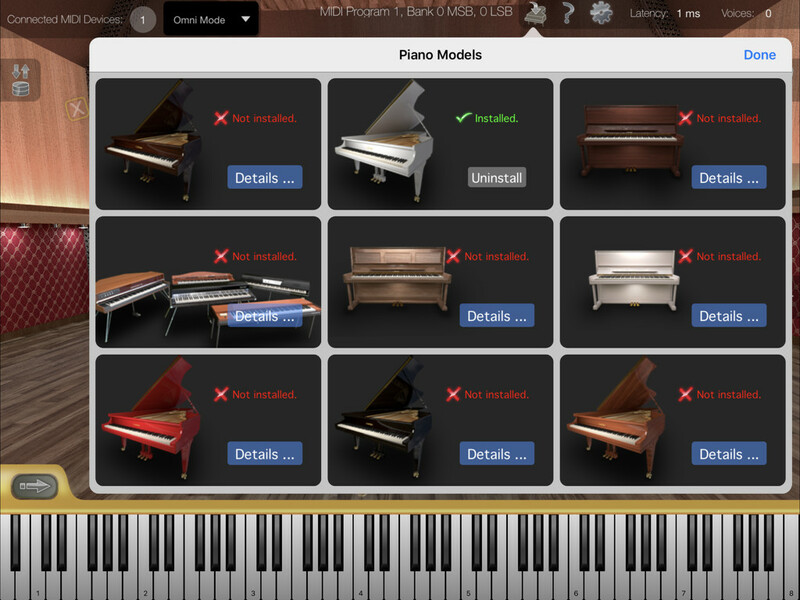 Once you downloaded more than one piano model, you probably want to switch between them. There are 3 ways to select the piano model you want to play with. 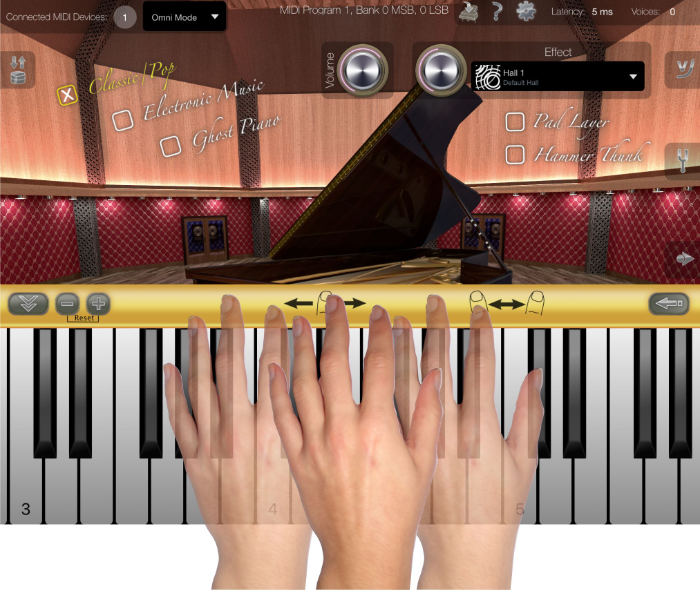 You may drag ("swipe") the virtual piano with your finger horizontally off the screen to switch to the next or previous piano model respectively. 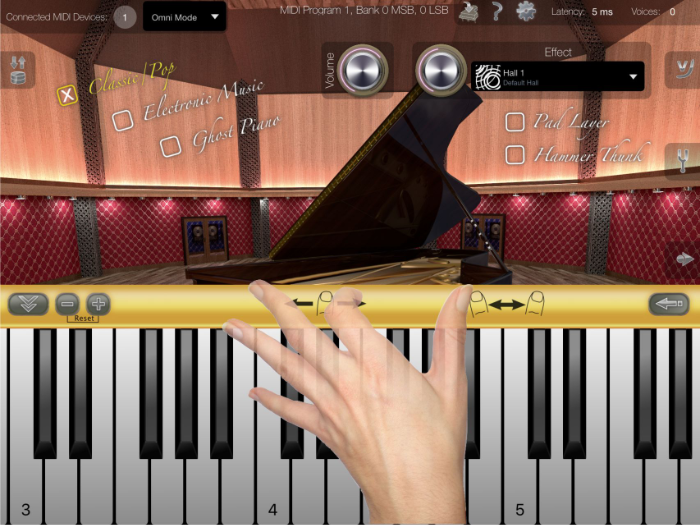 The virtual piano of the next (on left swipe) or previous (on right swipe) piano model will appear immediately on the screen instead and you will hear the respective new piano model when you trigger new notes either with an external MIDI keyboard or by using the virtual on-screen piano keyboard. 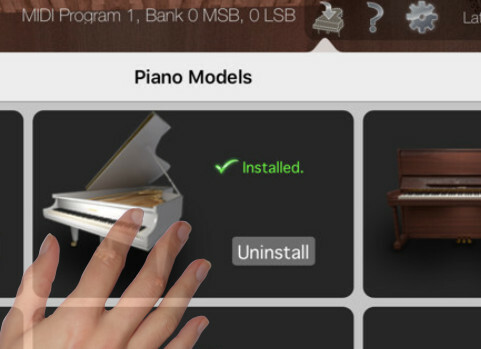 Another way to switch to a specific piano model is by using the piano models screen: Open the piano models screen by tapping on the small piano icon on the very top of the app's main screen, then simply tap on the piano model you want to play with. So the piano models screen is not only there to download and uninstall piano apps, it is also helpful to quickly switch between sounds. You may also change the sound remotely by sending a MIDI bank select and MIDI program change message pair to your iPad / iPhone. This way you can for example switch the sound remotely with your external MIDI keyboard. Each piano model, potential submodels and sound variations have their own Bank select number and Program Change number, which you can find on the very top of the app's main screen for the currently selected sound. For each piano model there are sound variations which you can choose from, which are described next. On the left side of the screen you find 3 check boxes which you can use to switch between 3 different types of musical styles. This check box trio is available for all piano models, including the E-piano models. Classic / Pop: This is the standard type of style that you would expect when playing a piano sound. So in most cases you will just use this musical style and hence this is the default selection. Electronic Music: When this style is selected, the piano's amplitude is modulated by a pattern. When the sustain pedal is not pressed down it will at first sound somewhat similar to a delay effect, however since this style is based on amplitude modulation, it has immediate impact on the notes you play, and when you press down the sustain pedal the pattern used for this modulation changes. When this option is selected, an additional control knob named "Speed" appears on the screen, which you can use to alter the speed of the used pattern in real-time. Ghost Piano: This style adds randomness to the piano's sound. It also shows you an additional control knob named "Ghost Level" which you can use to change the amount of randomness of this effect in real-time. When the "Ghost Level" is set to its minimum value the randomness is so small that it just adds some subtle variance and character to the piano's sound, whereas when you push the "Ghost Level" to its maximum value the piano will play with complete madness. This option might be useful to create atmosphere or to add thrill with a piano, e.g. for movie scores. On the right hand side of the screen, most of the acoustic piano models provide the following 2 options. Pad Layer: When this option is enabled, a warm analogue pad sound is mixed to the notes you are playing, additional to the actual piano sound. This sound option is especially useful as support in ballads to give the overall piano sound more presence. When this option is enabled an additional control knob named "Pad Volume" appears on the screen which you can use to alter the pad sound's volume in order to make the pad more or less prominent against the actual piano sound. Hammer Thunk: This option adds release triggered sounds and simulates the noise of real piano hammers that you would hear when releasing keys or when you release your sustain or sostenuto pedal. When this option is enabled an additional control knob "Hammer Volume" appears on the screen which, like in the previous option, you can use to make the hammer sounds more clearly or rather just subtle in the background against the actual piano sound. 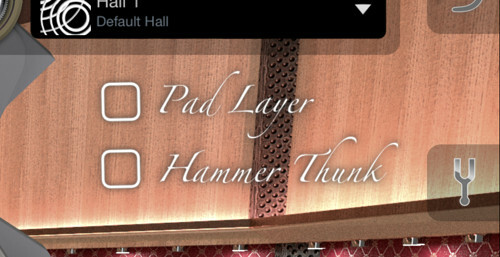 The "Pad Layer" option is also available for the E-piano models, the "Hammer Thunk" option however is only available for acoustic piano models. 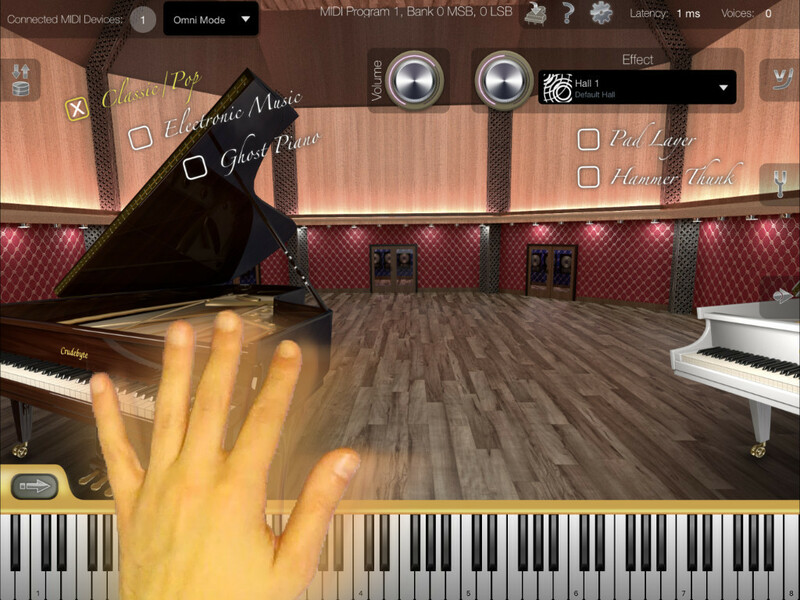 In the center of the screen, the E-piano models provide submodels which you can choose from. For example there were E-piano models produced over the years in several generations. Even though all of them had the same product name and were still produced by the same vendor, the actual e-pianos of their specific generations looked differently and also sounded differently. So for E-piano legends where several generations existed, you can use these check boxes to select the precise sound of the respective model generation. Other E-pianos legends in the past provided a variety of different sounds. For such E-piano models you can choose between some of their sound presets. 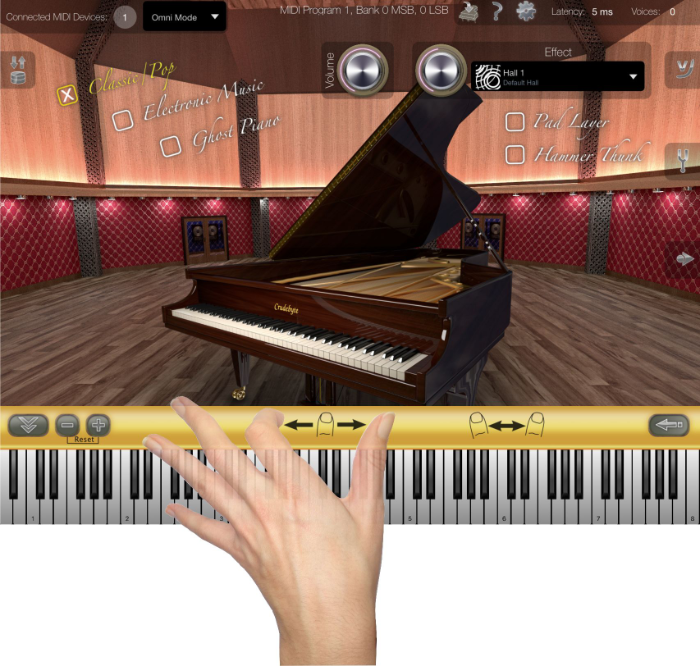 For quick tests, or while being on the road with no real MIDI keyboard around, you can use Colossus Piano's on-screen virtual keyboard. It provides the full range of 88 keys of a regular piano keyboard. Simply tap on its keys to trigger notes for the currently selected piano model. The keys on the keyboard will also lit up when notes are triggered by MIDI. So you may also use the on-screen keyboard as pure visual indication to control whether your external MIDI keyboard (or MIDI song) is configured correctly for triggering notes with this app. Keyboard Toolbar: Most settings of the virtual on-screen piano keyboard itself are available from the keyboard's toolbar, which is hidden by default. To show the keyboard's toolbar tap on the right-arrow icon. Enlarge Keyboard: Place two fingers on the approximately 1cm thick toolbar above the keyboard, then drag your fingers away from each other to increase the size of the keyboard ("pinch-zoom") on your screen to the desired dimension. Shrink Keyboard: Place two fingers on the approximately 1cm thick toolbar above the keyboard, then drag your fingers towards them to decrease the size of the keyboard ("pinch-zoom") on your screen to the desired dimension. Scroll Keyboard: When the keyboard is enlarged, you may scroll the keyboard horizontally by placing one finger on the approximately 1cm thick toolbar above the keyboard, then drag your finger horizontally either left or right to get the keyboard to the desired keys section. Each C key has a number attached which identifies the octave number. So you may use this number as visual indication to quickly navigate to the desired octave when the keyboard is enlarged to maximum size. The on-screen rotary volume knob, which controls the volume of the currently selected piano model. You may also use standard MIDI CC7 ("MIDI channel volume") messages to control the volume of the piano model remotely, i.e. either from an external MIDI keyboard, or automated with a MIDI song. The on-screen volume knob will automatically update to the new volume level when receiving a MIDI CC7 event. 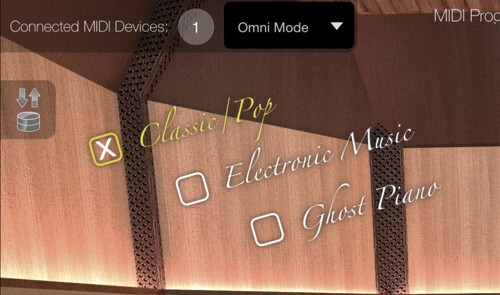 The global mix volume control which you can find on Colossus Piano's settings screen. Use this to control the app's overall volume, for example in case the overall sound is either too silent or too loud (i.e. when you hear distortion). The iPad's / iPhone's volume (hardware) control buttons, which you find at the side of your iPad / iPhone device. You may use these buttons to control the overall volume of the entire device, including other audio apps that may run on your iPad / iPhone. You may add a reverb audio effect to your sounds with the controls shown on the left. A reverb effect simulates the sonic reflections in a certain type of room. You can choose between a variety of reverb effect types, from very small rooms up to huge cathedral halls and tunnels. There are also some rather artificial reverb effect types which provide reverberation times that don't exist in nature. Especially electronic music genres often use such kind of artificial effects to add a very deep "ambient" feeling e.g. for slow tempo songs. With the reverb send level you can control the amount of volume of your selected piano model to be fed into the reverb audio effect. The higher the effect send level, the louder the audio effect will be noticable in the final audio output signal. 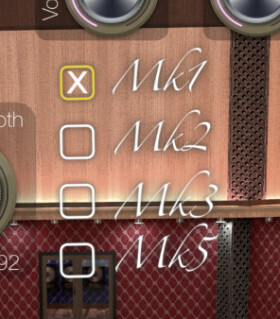 By selecting "Off" from the effect type combo box, you can also disable the effect completely, in case you prefer a completely "dry" version of your sounds. You might want to do that for example if you are routing Colossus Piano's audio output into a separate third-party audio effect app instead. You may also disable the audio effect simply to save CPU resources on your iPad / iPhone. You will quickly notice that Colossus Piano is not some sort of average app. Especially with the dark brown "Colossus Concert Grand" piano model (14 GB) we push your iOS device to its limits of what can be done on your iPad/iPhone, both technically as well from sound quality and realism aspects that you gain with this app. But don't be scared; we have put a load of work into not only getting the maximum out of your iPad/iPhone, but also to make this app very solid and user friendly. 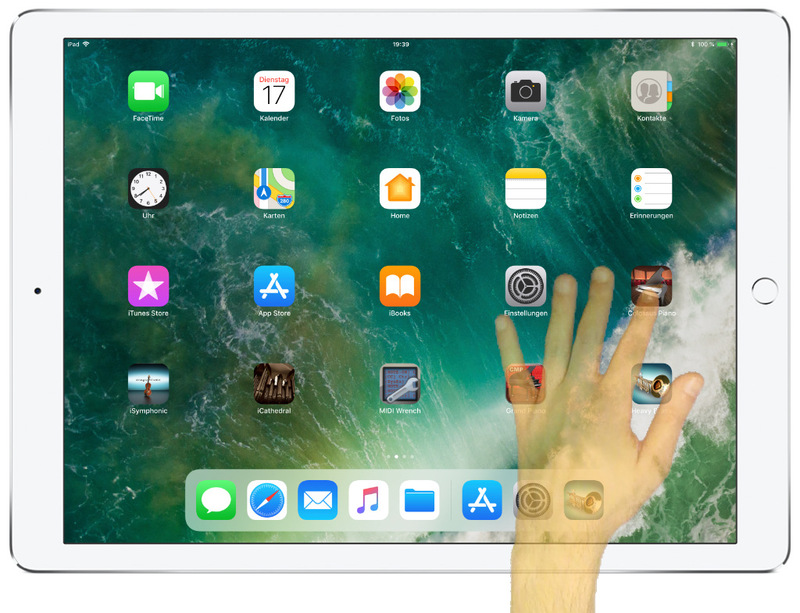 However you need to be aware that other apps or services running in the background on your iPad/iPhone may cause your device running out of hardware resources required for running the Colossus app. In case you are seeing a blinking warning message appearing on the screen, like shown on this screen shot, then you actually came into this situation where the app might potentially crash soon due to low hardware resources. In this case please make sure to stop other apps from running in the background to free up the required hardware resources for the Colossus Piano app. Apart from regular apps running in the background, there might also be other services running on your device in the background. For example when iOS is downloading or preparing an update of the operating system in the background, then a substantial amount of your hardware resources are reserved for this task. And even after iOS completed the installation of an operating system update, the hardware resources might still be reserved for several minutes or up to more than one hour. The most important resources for getting help are directly available from within the app. Simply tap on the question mark symbol to get access to the app's user manual, or tap on the feedback icon to get in touch with us. We can certainly help you with the questions you got. You like this app? Please support us by rating the app on the App Store.